Imagine machines tiny enough to be injected into the human bloodstream, mobile enough to make their way to specific locations inside the body, and intelligent enough to reduce cancerous tumors to harmless chemical ash. This is one among thousands of potentially revolutionary applications for nanotechnology�the looming technological breakthrough that could transform every aspect of our society. The Investor�s Guide to Nanotechnology and Micromachines is the essential resource for anyone who is seriously considering investing in nanotechnology. 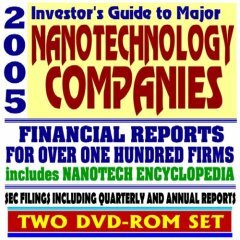 This electronic book on two DVD-ROM discs contains a compendium of major financial reports for over 100 companies involved in nanotechnology research or product development. Nanotechnology has been called the next industrial revolution, and refers to science, engineering, and technology at the level of atoms and molecules, with a length scale of 1 to 100 nanometers � a nanometer is one billionth of a meter. There are 112 companies with SEC reports included in this compendium: 3M, Abbott Laboratories, Abgenix, Aclara BioSciences, Adaptive Therapeutics, Advanced Bionics, Advanced BioSensors, Advion BioSciences, Agilent Technologies, AlienTechnology, Altair Nanotechnologies, Applera, Applied Molecular Evolution, Bacchus Vascular, Biogen, Biogenetic Ventures, BioSpace, Boeing, Boston Scientific, Cambrios Technologies, Canesta, Carbon Nanotechnologies, Cellomics, Cyberguard, Delphi Corporation, Dow Chemical, Dow Corning, Fairchild Semiconductor, Fairchild Semiconductor, Genencor International, GeneOhm Sciences, General Dynamics, General Electric, Harris, Holl Technologies, Honeywell International, IBM, Keryx Biopharmaceuticals, Lightpath Technologies, Lockheed Martin, Medtronic, MEMS USA, Merck, Microchips, Microcoating Technologies, Microfabrica, Microsoft, Molecular Imaging, Molecular Imprints, Motorola, Nano Superlattice Technology, Nanobac Pharmaceuticals, NanoBio, NanoBioMagnetics, Nanoblox, Nanochip, NanocleanTechnologies, Nanocomposites, Nanocoolers, Nanocor, Nanocure, Nanodielectrics, Nanodynamics, Nanofluidics, NanoFrames, Nanogear, Nanogen, Nanomateria, Nanometrics, Nanomix, NanoMuscle, NanoOpto, Nanophase Technologies, Nanopierce Technologies, NanoProducts, NanoScale Materials, Nanoselect, Nanosensors, Nanosolar, Nanosys, Nanotechnologies, Nano-Tex, National Semiconductor, Northrop Grumman Corp, NuGEN Technologies, Optiva, Optobionics, Pacific Nanotechnology, Pfizer, Picoliter, Procter & Gamble, Quantum Dot, Qynergy, Raven Biotechnologies, Reflectivity, Rockwell Automation, Sensicore, Solectron Corp, Spherics, Sun Microsystems, Superconductor Technologies, Texas Instruments, Ultratech, US Nanocorp, Vioquest Pharmaceuticals, Xeotron, Xerox Corp, Xsilogy, Xtrana, Zygo, Zyomyx, Zyvex. SEC reports include EDGAR database forms and filings, some dating back to 1994, with quarterly and annual financial reports, annual reports to security holders, 8-K, 10-Q, 10-K, forms 3, 4, 5, and much more. In addition to these corporate reports, we've included the entire contents of our Nanotechnology Encyclopedia CD-ROM, which sells separately for $25.00. This huge collection of documents and papers from 18 federal agencies, departments, and laboratories provides in-depth knowledge about ongoing research activities and highlights the potential of this amazing new technology. The National Nanotechnology Initiative (NNI) provides a multi-agency framework to ensure U.S. leadership in nanotechnology, investing in fundamental research. Our news and educational CD-ROM and DVD-ROM discs are privately compiled collections of official public domain U.S. government files and documents - they are not produced by the federal government. They are designed to provide a convenient user-friendly reference work, utilizing the benefits of the Adobe Acrobat format to uniformly present thousands of pages that can be rapidly reviewed, searched by finding specific words, or printed without untold hours of tedious research and downloading. Vast archives of important public domain government information that might otherwise remain inaccessible are available for instant review no matter where you are. Nanotechnology, the science of molecular engineering at the atomic scale, has captured the popular imagination. From movies to TV series to video games, utopian fantasies and horror scenarios involving nanotechnology have become a staple of the entertainment industry. The hyperbole surrounding this new technology comes not only from the media but also from scientists who exaggerate the anticipated benefits of nanotechnology to justify research funding, as well as from environmentalists and globalization opponents, who sometimes indulge in doom-and-gloom prophecies to advance their own agendas. The result is widespread misinformation and an uninformed public. In an effort to set the record straight, professor of communication studies David M. Berube has written this thoroughly researched, accessible overview of nanotechnology in contemporary culture. He evaluates the claims and counterclaims about nanotechnology by a broad range of interested parties including government officials and bureaucrats, industry leaders and entrepreneurs, scientists, journalists, and other persons in the media. Berube appraises programs and grand initiatives here and abroad, and he examines the environmental concerns raised by opponents, as well as the government and private responses to these concerns. With so much argumentation on both sides, it is difficult for anyone to determine what is true. 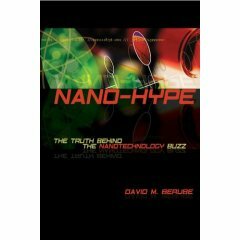 Nano-Hype provides up-to-date, objective information to inform the public. Based on over a decade of research and interviews with many of the movers and shakers in nanotechnology, this critical study will help the reader separate the realistic prospects from the hype surrounding this important cutting-edge technology. David M. Berube (Columbia, SC) is professor of communication studies at the University of South Carolina, Columbia, and the associate director of Nanoscience and Technology Studies at the USC NanoCenter. Although nanotechnology deals with the very small—a nanometer is 1/80,000th the diameter of a human hair—it is going to be huge. From the food we eat, the clothes we wear, and the products we manufacture to the composition of our bodies, everything is made of atoms. And if we can manipulate the atom, then that changes the rules of the game for almost every product. Coal and diamonds, for example, are both constructed from carbon atoms. It’s merely the arrangement of the atoms that differentiates an inexpensive fuel source from a pricey engagement jewel. While the science of nanotech cannot yet transform coal into diamonds, it is advancing rapidly and will begin to radically alter the business world during the next few years—and will continue to do so for the forseeable future. The buzz surrounding nanotech is comparable to that at the dawn of the digital revolution, which changed the face of how business operates. Unlike the Internet, however, which applied new technology to many old processes and businesses, nanotech is about creating entirely new materials, products, and systems (and therefore markets), as well as making existing products faster, stronger, and better. You may be tempted to wait until the buzz dies down before deciding how to integrate nanotech into your business, but don’t make the mistake of thinking of it as being light-years away. Even though it may sound far-off at times, within ten years nanotech will have huge effects on many industries, including manufacturing, health care, energy, agriculture, communications, transportation, and electronics. Within a decade, nanotechnology is expected to be the basis of $1 trillion worth of products in the United States alone and will create anywhere from 800,000 to 2 million new jobs. Nanotechnology will require you to radically re-think what your core business is, who your competitors are, what skills your workforce needs, how to train your employees, and how to think strategically about the future. Jack Uldrich and Deb Newberry explain exactly how you should prepare for nanotech’s imminent arrival. They identify today’s nanotech innovators, chronicle and project the rapid rise of nanotech developments, and show how to think strategically about the field’s opportunities and investments. The Next Big Thing Is Really Small provides a sneak peek at the technology that will transform the next ten years, giving investors and executives a road map for using small wonders to generate big profits. Jack Uldrich is the president of the NanoVeritas Group, a consultancy that focuses on helping businesses, venture capitalists, and governments understand and profit from nanotechnology. He is the former deputy director of the Minnesota Office of Strategic and Long-Range Planning. A guide to nanotechnology and its implications for businesses The development and marketing of nanotechnology products will have a profound effect on all segments of the business community. This book outlines the foundational principles of the technology and its importance to business leaders over the coming years. It offers interviews with movers and shakers in the nanotechnology movement and gives business leaders a discussion of the promise, and the danger, of this new technology. It describes the technology and its implications in simple terms for managers outside the high-tech realm and describes specific steps they can take to be prepared for the nanotechnology revolution. The book also includes descriptions of the latest in nanotechnology research and near-term applications for the technology. Dan Shafer (Del Rey, CA) is a well-known author of technology and computer books, a sought-after speaker and seminar presenter, and an investigative reporter and columnist. He is a Senior Associate of the Foresight Institute of Palo Alto, California, which was founded to foster invention and encourage public debate before the emergence of nanotechnology. Currently receiving vast amounts of research funding from government and industry alike, nanotechnology is the science of matter at the scale of one-billionth of a meter or 1/75,000th the size of a human hair. In addition to the numerous advantages provided by this scale of miniaturization, quantum physics effects at this size range provide additional novel properties. By manipulating atoms at this building-block level, scientists can create stronger, lighter materials with tailored properties. Combining research from many disciplines, near-future nanotechnology applications involve everything from scratch-proof glass to internal drug delivery systems to a sugar cube�sized computer capable of storing the information from the entire United States Library of Congress. CHARLES P. POOLE Jr., PhD, a professor emeritus in the Department of Physics and Astronomy at the University of South Carolina is a member of the USC nanotechnology center. FRANK J. OWENS, PhD, is a senior research scientist of the U.S. Armys Armament Research, Development, and Engineering Center, and a professor of physics in the graduate school of Hunter College of the City University of New York. Both authors are Fellows of the American Physical Society. This title demystifies the topic for investors, business executives, and anyone interested in how molecule-sized machines and processes can transform our lives. Along with dispelling common myths, it covers nanotechnology's origins, how it will affect various industries, and the limitations it can overcome. This handy book also presents numerous applications such as scratch-proof glass, corrosion resistant paints, stain-free clothing, glare-reducing eyeglass coatings, drug delivery systems, medical diagnostic tools, burn and wound dressings, sugar-cube-sized computers, mini-portable power generators, even longer-lasting tennis balls, and more. How nanotechnology will transform the war against terror. Daniel and Mark Ratner tell you what's real today-and what it'll take to transform tomorrow's applications from science fiction to reality. Along the way, they debunk the myths of nanotechnology, and offer new insight into its profound ethical, political, and social implications. Miniaturisation has revolutionised the semiconductor industry by making possible inexpensive integrated electronic circuits comprised of devices and wires with sub-micrometer dimensions. This is a very hot area of research with large amounts of venture capital and government funding being invested worldwide. This book highlights the growing information need in this area, presenting readers with an insider�s view of the opportunities and risks associated with the development of nanotechnology initiatives. It is ideal for executives and investors with limited understanding of the technology itself who need to know how it will impact on them and what the future developments are likely to be. 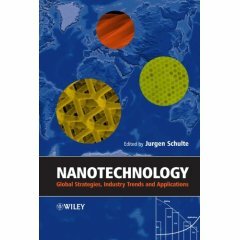 Written by leading authorities from around the world, Nanotechnology: Applications and Trends provides a unique global perspective on this hot new area of research and development. Nanotech for everyone! The friendly, non-technical guide to the next industrial revolution. * Discover the world's next $1 trillion industry! MARK RATNER, winner of the 2001 Feynman Prize in Nanotechnology, is Charles E. and Emma H. Morrison Professor in Chemistry at Northwestern University. He is widely credited as the "father of molecular-scale electronics"�thanks to his groundbreaking work with Ari Aviram that first envisioned how electronic circuit elements might be constructed from single molecules and how these circuits might behave. Ratner is a member of both the American Academy of Arts and Sciences and the National Academy of Sciences. He lectures worldwide on nanotechnology and its implications. DANIEL RATNER, an engineer and tech entreprenteur, has founded two successful technology startup companies, serves as industry advisor to several other high-tech ventures, and was recently awarded the prestigious "30 Under 30" entrepreneurs' award by Philly Tech magazine. Everyone in the modern world knows what technology is. But what is nanotechnology? Taken from the Greek, nano means "one billionth part of" a whole. In modern parlance, it means very, very small. Nano-tech is the next step after miniaturization. Cell phones are miniaturized versions of traditional landline phones. Wristwatches are miniature versions of clocks. Desktop computers are miniature versions of the original analog calculating machines. Miniaturization is commonplace in today's world. In tomorrow's world, nano-tech will be the new common technology. It will affect everyone on the planet, and may change civilization as it is now known. Scientific American's UNDERSTANDING NANOTECHNOLOGY presents the cutting edge of a new technology that will find usage in medicine, space exploration, communications, manufacturing, and almost every other aspect of modern society. Imagine getting an injection of "smart" molecules that can seek out cancer cells and destroy them without harming any of the surrounding tissue. Imagine a simultaneous space launch via the Shuttle of thousands of robotic probes, each no bigger than an insect, and each programmed to do a single task in concert with all of the others. And that's just the beginning. From the bestselling authors of Blur�a defining book of the Information Age�comes a startling glimpse into the near future and the emerging economy that awaits us. It�s Alive foretells the jolt the world is about to receive as the science of molecular evolution races out of the laboratories and into the business world. Think back to the early 1970s. Imagine the opportunities for your business, career choice, and investments had you received an advance report on the ways in which computer and information technology would revolutionize the world. It�s Alive provides that opportunity today: a realistic and persuasive look into the future�the molecular economy�and how it is starting to overtake and reshape the Information Age. Today�s gene mapping and molecular engineering are equivalent to the introduction of transistor radios at the advent of the information economy. Solid-state technology moved from the labs into the business arena, providing in turn the transistor, the microprocessor, and the modem�and the information business. During the next ten years, molecular technology will follow the same pattern, moving from the lab and into the basic operation of the corporation itself. Chris Meyer and Stan Davis are our guides in understanding this new future. They show that not only biological systems evolve. The rules of evolution help explain the process of change in biology, business, and the economy, thereby providing a management guide to the business world around the corner. It�s Alive is not science fiction or futurism. It bases its insights and predictions on the impact the molecular economy is already having in such diverse business environments as manufacturing, financial services, and energy. Through in-depth case studies of Capital One Financial, the U.S. Marine Corps, British Petroleum, and the biotech firm Maxygen, Meyer and Davis show how adaptive behavior works in the real world. As the rules of evolution combine with the connected economy, our business world will become unpredictable, volatile, and continually adaptive�in other words, alive. Christopher Meyer is the director of the Center for Business Innovation in Cambridge, Massachusetts, a business research and consulting group supported by Adventis and Cap Gemini Ernst & Young. He is also a founder of the BIOS Group, a firm created to develop adaptive software solutions for management, and the coauthor (with Stan Davis) of Blur and Future Wealth. Stan Davis is an independent Boston-based scholar, consultant, and public speaker and a senior fellow of the Center for Business Innovation. He is the author of Future Perfect and coauthor of 2020 Vision.